An extraordinary memorial. The mainstream media, of course, ignored it. 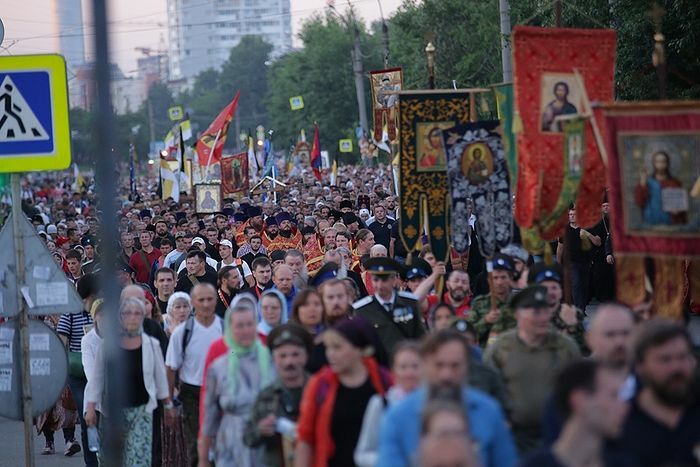 The Russian Orthodox Church has been celebrating the centenary of the martyrdom of the last imperial family of Russia with numerous events throughout Russia all year, with the celebrations culminating in last night’s Patriarchal Divine Liturgy in Ekaterinburg and all-night cross procession in their honor. 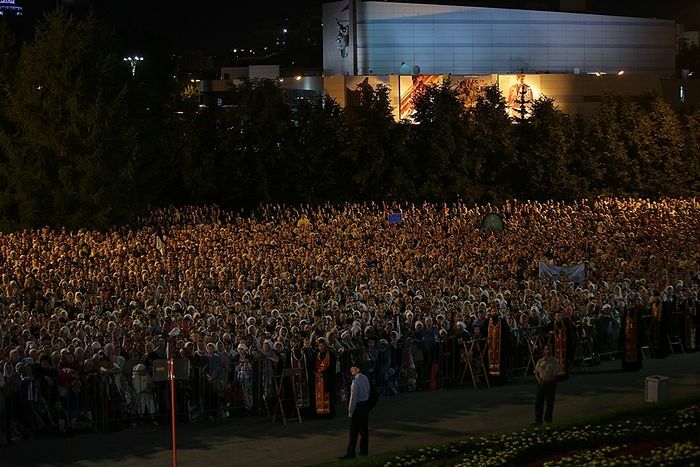 100,000 faithful Orthodox Christians from around the world, including Azerbaijan, Australia, Austria, Belarus, Bulgaria, Great Britain, Germany, Kazakhstan, Kyrgyzstan, China, Lithuania, Moldova, New Zealand, Serbia, USA, Tajikistan, Turkmenistan, Uzbekistan, Ukraine, France, Estonia, South Korea, and Japan, gathered in Ekaterinburg last night for the liturgical celebrations, reports the site of the Russian Orthodox Church. The first Royal Days procession took place in 1992, with the participation of but a few dozen. The event began with the Divine Liturgy celebrated on the square in front of the Church on the Blood in Ekaterinburg, built on the site where the Ipatiev House once stood, where the family was murdered. 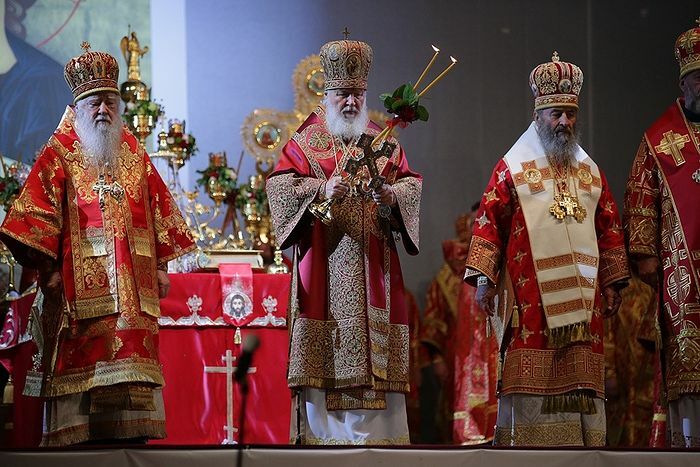 The service was headed by His Holiness Patriarch Kirill with more than 35 hierarchs and multiple clergy concelebrating. A special platform was erected for the Liturgy in front of the gates of the lower church, where the “Royal Room” is located—a chapel in honor of the Royal Martyrs, built on specific site of their martyrdom. 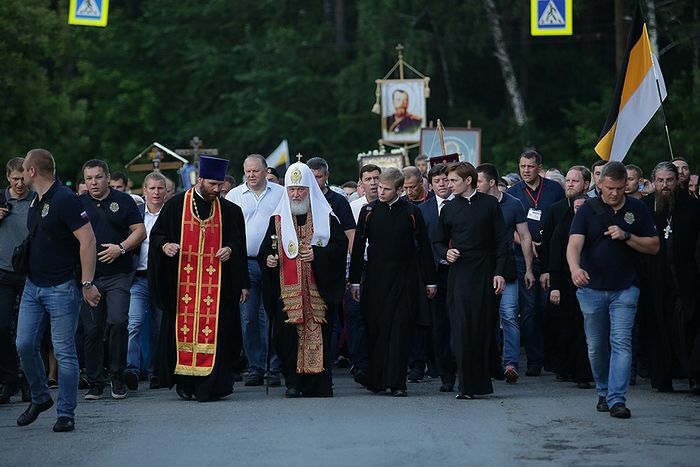 Following the Liturgy, the patriarch led the traditional Royal Cross Procession from the place of martyrdom of the holy Royal Martyrs and their servants to the Monastery of the Holy Royal Passion-Bearers at Ganina Yama ravine, covering a distance of 13 miles. 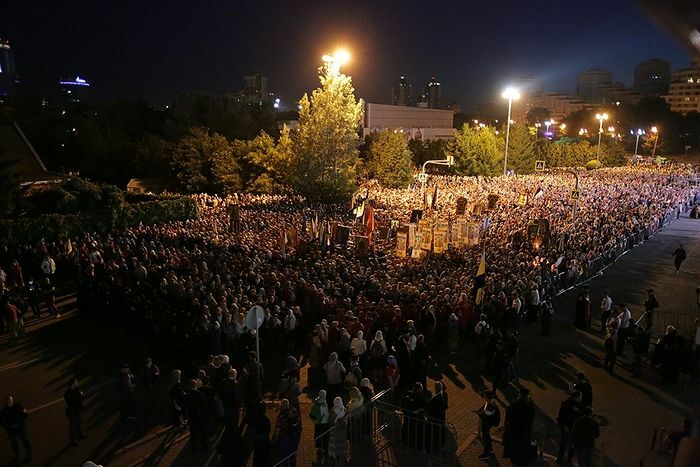 According to law enforcement agencies, about 100,000 took part in the procession. 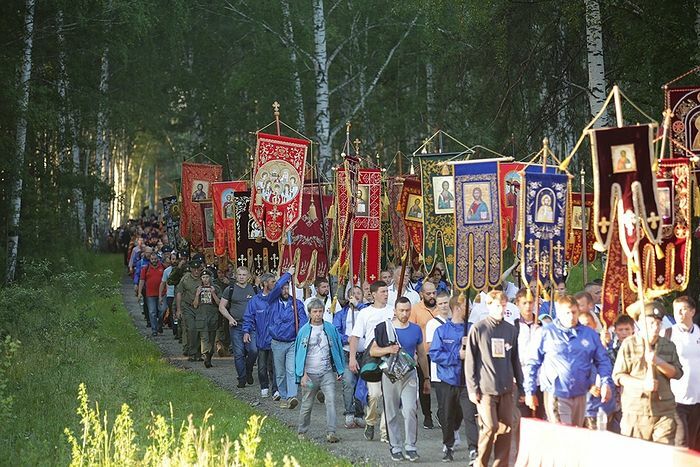 According to tradition, the faithful carried banners and icons in the procession, including a 6.5-ft. icon of the Tsar-Martyr, painted in 2017 for the Church of the “Reigning” Icon of the Mother of God at Ganina Yama. Together with the kiot, the icon weighs 330 lbs. A special bier on wheels was made to move the heavy icon. 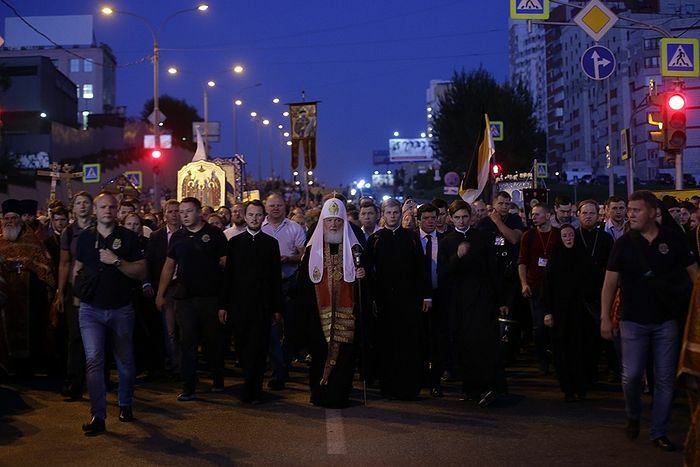 The procession was also accompanied by 25 mobile groups from an Orthodox charity service, consisting of clergy, representatives of the Dormition Orthodox Brotherhood of Ekaterinburg, sisters of mercy, and volunteers, who provided assistance to those who could not walk the entire route of the procession. Field kitchens and tests were also set up at the Royal Passion-Bearers Monastery for the pilgrims to rest. It is with a joyful feeling that I walked this sorrowful path with all of you, on the day when we remember and celebrate a tragic event—we celebrate because through this event, the Royal Family was numbered among the saints. We believe today that the family of the Royal Passion-Bearers is with us in this prayer and in this procession. Elevating prayer to these holy God-pleasers, we entreat them to be supplicators before God for our Russian land, for our people, for our Church, that the Lord would protect our Fatherland and people, and the Church from every turmoil, from divisions, from schisms, from every human injustice, in order to keep the truth of the faith and the piety of our people. We believe that if we preserve this, then we preserve Russia, and the country will be great and the people will flourish. 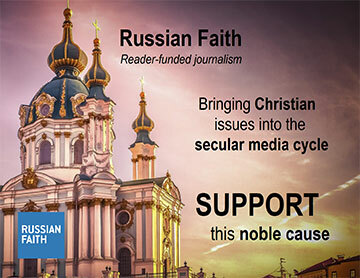 May the Lord keep the Russian land by their prayers. Amen.